Add some beauty to mother’s garden with this lovely gift. This wind chime not only adds lovely music to any outdoor space, it has it’s own little gardening details. Pressed between the butterfly’s glass wings are flowers. These lovely details will be appreciated by any gardener. Flowers are a classic gift for Mother’s Day, but Paper Sprouts takes it to the next level. 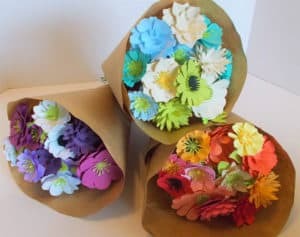 These gorgeous bouquets are made up of handmade paper flowers. They can be displayed indefinitely, or they hold a secret. The paper they’re made out of is actually embedded with flower seeds. So your mom can plant these “flowers” and enjoy her own flowers in her garden. This gift is perfect for a mom with a sense of humor. This t-shirt says “I wet my plants” and features a watering can and cute flowers. Available in men, women, and youth sizes in black, white, blue, gray, and pink. 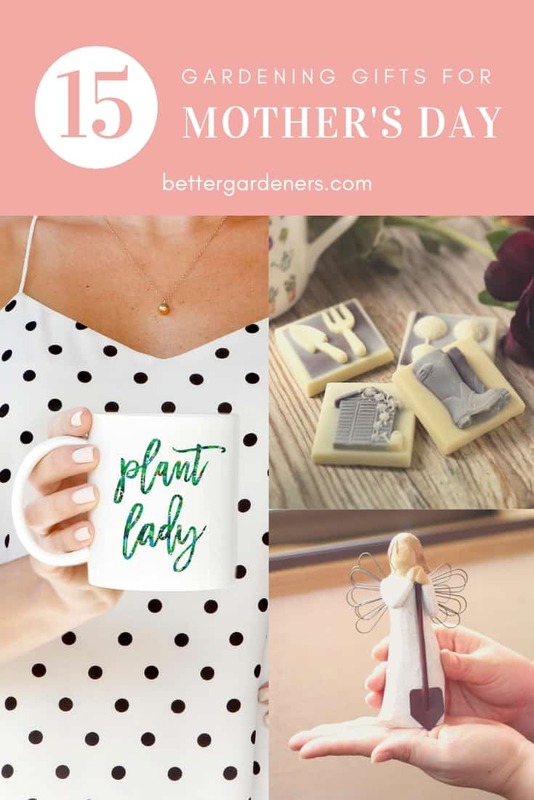 A good mom deserves good chocolate and this set is perfect for gardeners! Chocon Choc makes this lovely gardening themed chocolate set. 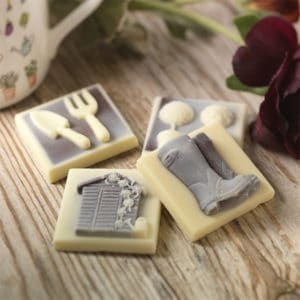 It comes with four pieces made with a combination of white and dark chocolate with the designs of garden tools, topiaries, garden boots, and a shed. Handmade in the UK, any gardener mom will love these. If you want to get a practical gardening gift, this item is perfect! Make garden work easier with this combination stool & kneeler. The “seat” is adjustable for comfortable sitting or kneeling while working in the garden. It also features pouches for keeping tools nearby. Check out more garden kneeling pads. If you feel like buying jewelry, here’s a cute piece for gardening moms. 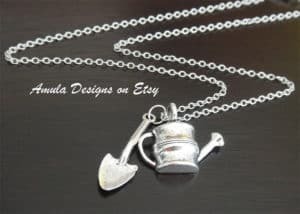 This necklace comes with two garden-themed charms: a shovel and a watering can. Comes in a classic silver color with alloy metal plated 1″ charms. This gift is perfect if you want to give your mom a guardian angel for her garden. Design and hand painted by artist Susan Lordi, the Willow Tree Angel of the Garden is a gorgeous figure holding a shovel. One thing to note, it is not designed for outdoor display, but looks wonderful on a shelf in your home or displayed in a garage. If you’re looking for a personal gift, this is perfect for moms who like to keep house plants. Occasions Boxed makes the personalized wood planters. 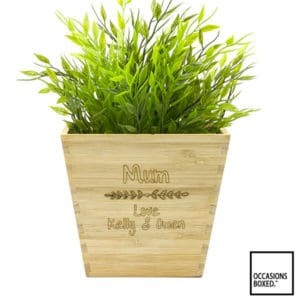 Made from eco-friendly bamboo, they personalize the planter by laser engraving with any names of your choice. They can also change “Mum” to “Mom” “Mother” “Grandma” or any other name. If your mama loves her morning cup of coffee or tea as much as she loves working in her garden, get this mug! This 11 oz. ceramic mug says “Plant Lady” on the side in a cool cursive script. Microwave and dishwasher safe. Include some of your mother’s favorite tea or coffee to make a gift bag she’ll really appreciate. These planters are so cute! 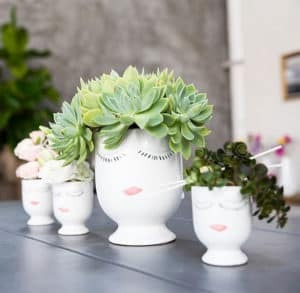 Handmade by Bohemia Goods, these gorgeous vases feature feminine faces. Once you put flowers or plants inside, then it looks like the woman’s hair. Made in various sizes and “skin tones” you can order one or a few for your mother to display some of her favorite plants or flowers. These garden clogs are cool, comfortable, and waterproof! Available in over a dozen gorgeous designs, these garden shoes are perfect to keep feet dry even in the muddiest conditions. Easy to slip on and off to keep dirt outside the house. Made in the USA from 100% recyclable material, these shoes are non-latex and vegan friendly. Let your mother lay claim to her domain! 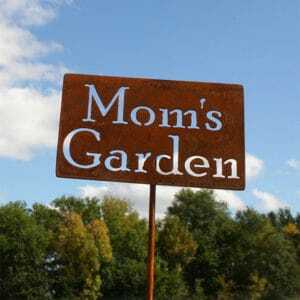 The handmade signs from 81 Metal Art are perfect for display in a flower or vegetable garden. Made from steel, they’re given a rustic look and come with a stake to easily display in your yard. Available in three sizes. Weeding becomes stylish and fun with this floral garden tools set. Completely with 10 tools and a gorgeous lilac carrying case, this kit has everything you need for the most common garden tasks. Great whether mom grows flowers, veggies, or both! If your mom enjoys natures as much as she enjoys gardening, this is the perfect gift for her. 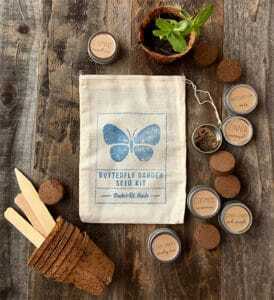 Deckerrd Seeds makes these lovely butterfly garden seed kits. Included are six different types of seeds (Zinnia ‘Carousel’, Nasturtium, Coneflower ‘Pale Purple’, Cosmos ‘Sensations’, Lupine ‘Russell Mix’, and Corn Poppy ‘Shirley Mix’), six coco pots, six soil pellets, and six wooden plant markers. With the included planting instructions, you have everything you need to start your butterfly garden. This is a great gift to kick off the growing season. Garden Republic makes this cool herb garden starter kit that has everything you need to grow herbs indoors or out. It comes with seeds for cilantro, thyme, parsley, and basil which you can start in the burlap grow bags using the potting soil disks. Go on to plant them in your garden or the wood grow box. use the bamboo markers to keep track of your crops. Check out more herb garden gift sets. Need more gift ideas? Check out these Mother’s Day gifts for book lovers and meditaiton and yoga gifts for moms. We also have recommendations for unusual gardening gifts and practical and fun gifts for gardeners.